I came up with this recipe because what I thought was an epic fail turned out to be an amazing discovery. I attempted to make homemade yogurt with macadamia milk, which did not turn into yogurt, but Cultured Macadamia Milk. Because macadamia nuts are to expensive to throw out I was determined to come up with a way to use this perceived failure. 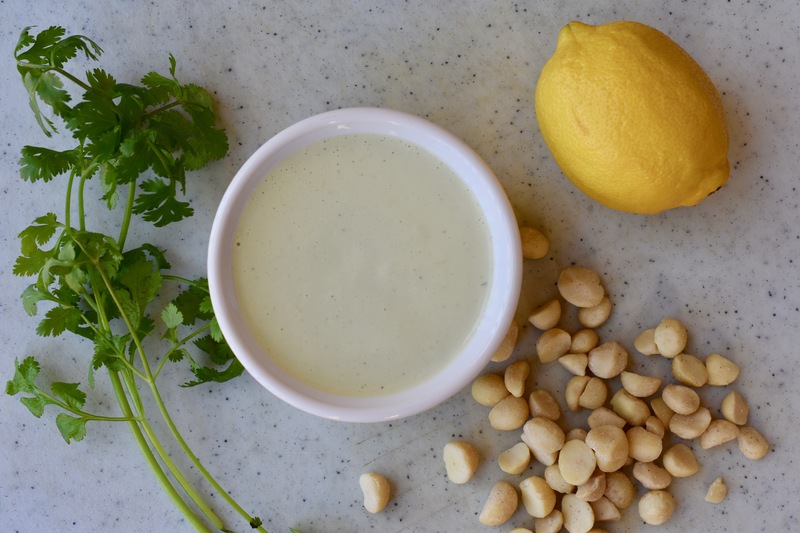 That is when I came up with the Creamy Cilantro Sauce/Dressing, which turned out to have incredible flavor. Combine all the ingredients into a high-speed blender. Blend until smooth and creamy, about 60 seconds. I’ve used this for a sauce for Falafels, bowls, burritos, salads. The possibilities are endless. Don’t you just love it when disaster turns into a triumph! Thanks for stopping by Cathryn’s Kitchen. Sometimes I am truly amazed. Can I just use any olant mikk in olace if macadamia cultired milk? Hi Rosemarie. You can substitute any plant milk for the cultured milk. It might change the flavor a little, however, I think it will taste just as delicious as with the cultured milk.